Click the forum on the course page. Forums are organised into Discussions which have one or more messages. To start a new discussion, click Add a new discussion topic. Give your topic a Subject and write your Message. (Add an attachment if required). If the message is very important and you want to keep it at the top of a discussion forum, click ‘Pinned‘ to pin it to the top. You can click to send an email to subscribers immediately. Otherwise, Moodle waits 30 minutes before sending your message, so you can make any edits. Click Post to forum. The message then appears as a new topic. To reply to a message in a forum, open the message and click the arrow to reply. 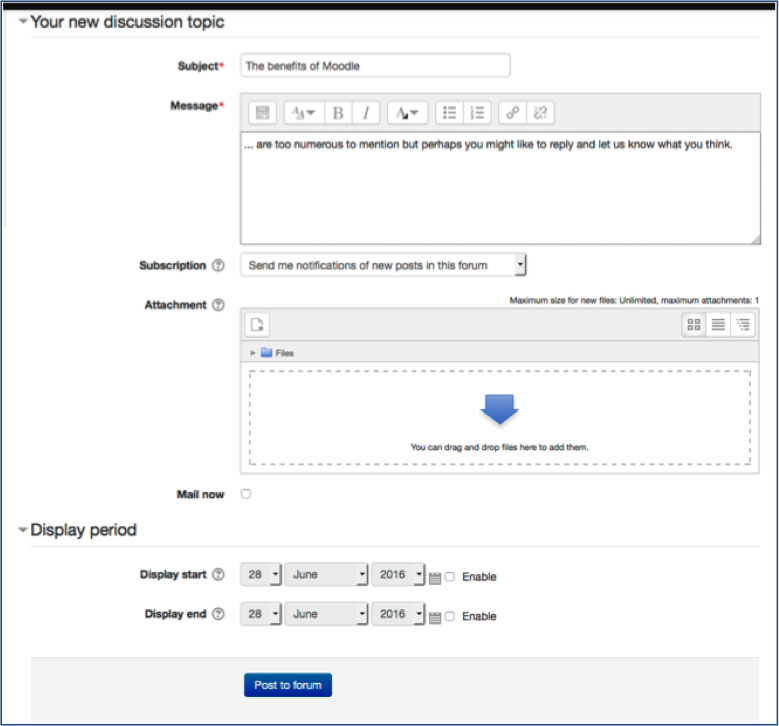 Then, add your message in the same way as you created a new discussion topic above. Complete it with Post to forum. The reply appears below the original message – indented if the default setting Display replies in nested form applies. Everyone can edit or delete their own posts. They need to do this within 30 minutes or it will be distributed in its original form to subscribers. Teachers and above can edit and delete student posts should the need arise. They can also use Split to separate a message that has been posted to the wrong thread or may be inappropriate and needs to be isolated from the rest of the discussion thread. It remains as a standalone message after this process i.e. it is not possible to attach it to another thread. 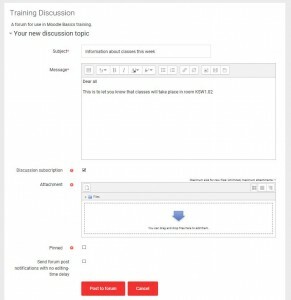 Teachers and above can also use Move the discussion to move a discussion topic (thread) to a different forum.